By this useful Article I guide you that how to install Printers and Scanners in Linux Mint and Ubuntu old and latest versions. Lot of Linux have printers and scanners, and it is very difficulty to install Printers and Scanners of different companies on Linux basis systems. It is very different that Printer and scanners drivers CDs available for Windows, but Linux basis system are not have any CD. How to install all such type of Drivers with easy, Linux Mint, Ubuntu are very popular in all over the world and free open source. 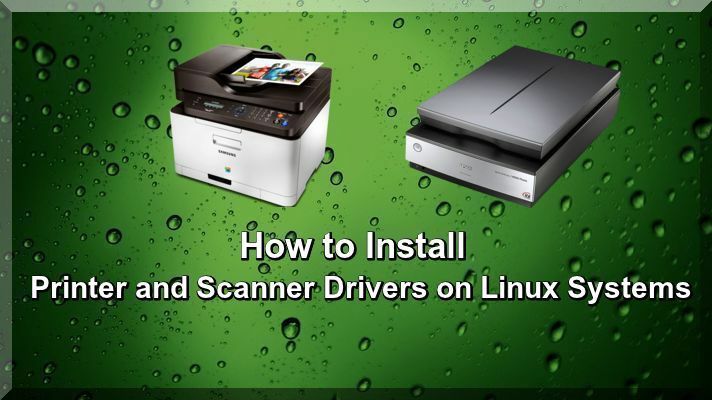 In any case Linux Mint and Ubuntu drivers automatically, but scanners and Printers have problems, so now I describe step by step how to install such type of complicated drivers. You have already read lot of tutorials but this is very different. Further occasionally it is essential to add a printer or scanner to the Linux based systems yourself, by means of the application Printers and Scanners. In that case the application Printers already contains the driver for your printer, but you have to "designate" the printer first. Now I discuss the following points about different types of Scanners and Printers. HP Printers and scanners are widely used in all over the world. Recently Linux basis system has been used widely, all printers and scanners manufacturers propose a flaxen from time to time even excellent support for Linux basis system, printers and scanners, Hewlett Packard is still the safest and high demand in Linux basis system, such as Linux Mint, and Ubuntu. In any case your HP printer is plug and play and how to install it in your computer and it is too prepared. For initial installation connect your printer to your computer to use USB cable or Network printer. Now do the following steps. Go to Terminal and use the following Command for HP firmware for Linux Basis system. After that Press Enter and submit your password. This is the version of HP LIP Toolbox (hp lip-GUI) in the repositories of Ubuntu or Linux Mint, it is old for your latest brand printer, if you want to install latest version of HP LIP Toolbox, download here. You have installed successful your HP Printer or scanners than Launch HP HP LIP Toolbox and click on gray Ubuntu logo in Dash home. Query: HP LIP and then Click on HP LIP Toolbox and Tab Printer control - Set as Default. Now Close HP LIP Toolbox, because you have done, now your HP Laser jet or any printer is ready for printing. First connect your printer to your computer by USB cable or Network Printer Then turn on your printer. It is necessary to add your printer or scanner to the system yourself, by means of the application Printers. In that case Printers already contains the driver for your printer, but you have to "indicate" the printer first. Now launch the application Printers, you can use the search box in your menu to search it is present by default in all editions of Ubuntu and Linux Mint. In the application Printers, click the button Add with Plus Sign and follow the steps. For example your printer is too latest for the database in version of Ubuntu and Linux Mint or Ubuntu. Download the compressed Linux driver from the website of Sam sung. You can find your driver Sam sung's download center here. it is easy way to find and search your concerned driver. Now continue to downloaded compressed file has landed in the folder and then unzip it. Now use the following command in terminal. After that Press Enter. Now go to the uncompressed folder to us the following command in terminal. One thing note that if you find any error message, stating: No such file or directory is available, now you can use the following command in terminal. After that make the terminal window full screen, due to frustrating license and use the following command in terminal and press enter. After that check an annoying license agreement, which you have to walk through line by line, by repeatedly pressing Enter. Note that you have to do it slowly and carefully, because if you press Enter. Then press "y" in order to agree to the license agreement. You have to run the above command all over once again.. Finally now you are done and enjoy your latest Sam sung Printer or Scanner on your Linux Basis System. In these days Canon PIX MA printer is easily for installation in Linux Mint and Ubuntu, Now I guide you how to install it, see the following instructions step by step. First connect your printer to your computer to use USB cable or Network and then turn on your printer. After that it is necessary to add a printer or scanner to the system yourself, if your Printers already contains the driver for your printer, but you have to "indicate" the printer first. Now launch the application Printers, you can use the search box in your menu and find it by default in all editions of Linux Mint and Ubuntu. In the application Printers, click the button Add with Plus Sign. For example your printer is latest and not installed automatically use the following steps. Go to the Canon Website and download the driver for your PIX MA printer. When you have a multi-functional printer that also contains a scanner and also download driver for the printer part of your multi-functional. Now use the following command in terminal, and download it and unzip it. After that, launch your File Manager and go to the folder Downloads, in folder you will find another folder with a long name, that starts with cnijfilter, then Open that folder and click through to its sub folder packages, and now next step differs for 64-bit and 32-bit. So check whether your system is 64-bit or 32-bit. Double-click first the package called cnijfilter-common. For 64-bit select the one whose name ends on amd64.deb and for 32-bit select the one whose name ends on i386.deb. Then double-click the package cnijfilter-(name of your printer series). For 64-bit select the one whose name ends on amd64.deb and for 32-bit select the one whose name ends on i386.deb. Now Finally Reboot your System, your printer should be able to print now. Brother Printers and Scanners are very easy for installation in Linux Mint and Ubuntu, it will be automatically Installed. If you get any problem how to install it see the following steps. Connect your printer to your computer by USB Cable or Network Cable Then turn on your printer. It is necessary to add a printer or scanner to the system yourself, by means of the application Printers. In that case the application Printers already contains the driver for your printer, but you have to "indicate" the printer first. So launch the application Printers. You can use the search box in your menu and search present by default in all editions of Linux Mint and Ubuntu. In Printers, click Sign Plus button, for example your printer is too latest for the database in your version of Linux Mint and Ubuntu follow the following steps has given below. But one thing note that Installing manually driver of Brother Printers and Scanners are very difficult, because Brother has issued a generic install script, if you want to install Brother Printers manually follow the steps. Now search the Brother Website go to the download section of the Brother website and search your Pinter or Scanner Model. For "OS Version" you select Linux (deb). For "OS Family" you choose Linux. After that click the Driver Install Tool and download Linux-brprinter-installer. Then save the downloaded file in the folder Downloads. Don't extract the zipped file, but leave it there just as it is. Now go to terminal and use the following command. Now follow the steps that the installer script presents you, when asked for the printer model name, type it and press Enter. Now I given you following some example of Models. Once thing note that question about the Device URI, you answer N for a USB printer and Y for a network printer. For a network printer, you select in the next question the last option, (A): Auto. For that, you type the number of that option and you press Enter. Now finally Reboot your computer. You have installed latest Linux 18 64-bit and Ubuntu 16.04 the location for the supporting library files has changed, and the driver for the scanner feature doesn't always take that into account. The Brother driver puts them in /usr/lib64, whereas your operating system expects them in /usr/lib. Now for a 64-bit system, you required the following three commands in terminal. It is not necessary, but do it just in case add yourself to the scanner user group. You can use a click-click-click graphical system tool for that, but this varies among editions, but the terminal works in all editions. Now I given you an example is easiest. If your name is ABC, your username is XYZ (no caps), so the terminal command would be conducted. Once again reboot your system and now you are done. Now you can use following simple command for scan. This launches simple scan with root permissions. Now it should recognize the Brother scanner. In view of the above you have already read lot of tutorials about how to install Printers and Scanners in Linux Mint and Ubuntu, this tutorial is very different, I have mentioned all things to do required step by step.